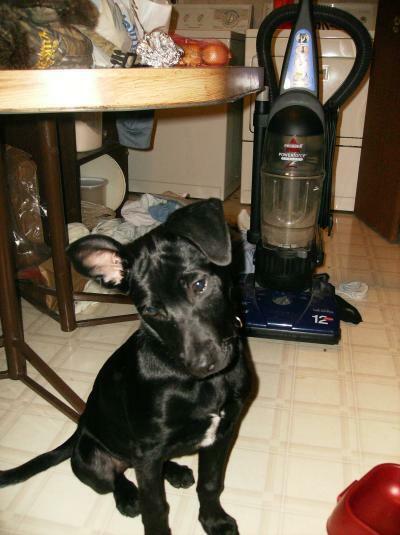 Many pet owners have mixed breed dogs. Knowing the mix is not only interesting, but can be helpful in understanding your dog's behavior and by giving you an insight into potential health issues. This is a guide about, "What breed is my dog?" (German Shepherd mix). Does anyone have any idea what mix my puppy is? 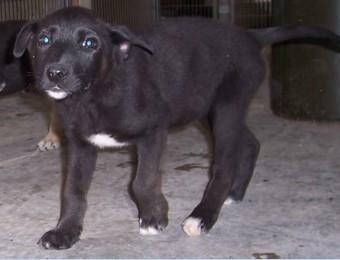 The animal shelter said she is a German Shepherd mix, but they were not sure what her mix is. Any feedback would be great! Thanks! 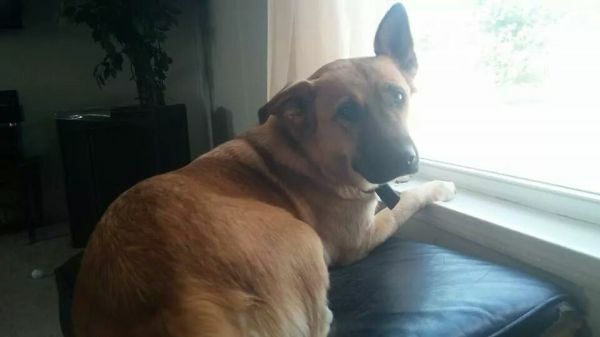 It's a German shepherd mix, but I don't know the actual breed. Please try to help me. Someone told me that he is a street dog. When I bought my dog it said she was an Alaskan Husky, German Shepherd, Alaskan Malamute mix. Is this true? Here's a picture. Definitely has German Shepherd in her. Seems to be a good description. Whatever she is, she's a beautiful dog. She is definitely a German Shepherd cross. She's beautiful whatever she is! One day, she'll look VERY Shephard. Give her bread and lightly cooked ground meats/pork, with veggies and garlic salt....no vitamins/minerals after she's gained weight. Well I dont think it is mixed with Alaskan Malamute but it definatly has a LOT of German shepard in it. 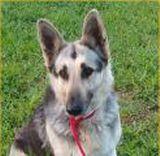 Here is a German Shepherd/Alaskan Malamute mix. This one does not look like yours very much. Hope this helps. I would say certainly gsd and husky, but she doesnt exhibit any malamute attributes. She looks like she has a very sweet temperament, regardless. Does she like to climb, escape your boundaries, if so that is a good indication she has a little husky in her.!! Hi! Your dog looks strangely like mine! The petshop where I bought her told me that she was a siberian husky mix. But I don't know with what other breed she could be mixed! I know her mom was a siberian husky. Do you have any idea of the other breed? She is 8 months, weights about 40 pounds and is 20 inches tall. Her ears are sometimes floppy, sometimes straight. It depends. My male puppy Levi looks like both of yours guys dogs! 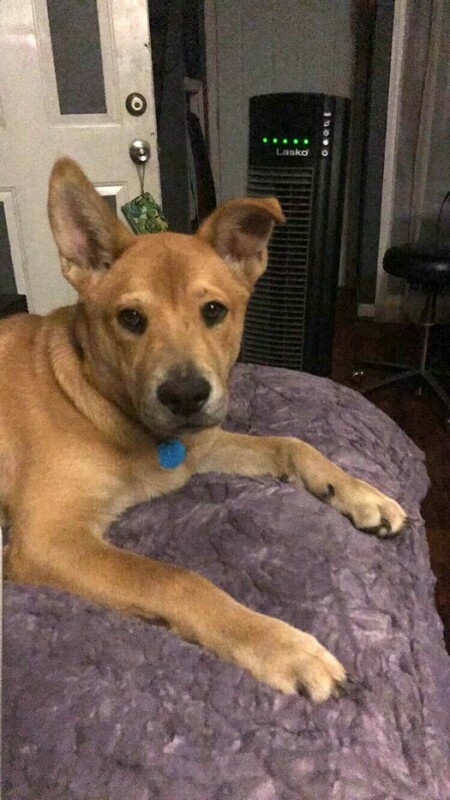 We got him from the pound and they also said he was a German Shepherd husky mix. I have a husky/Shepard mix and she is beautiful! Every time I walk her, people ask what she is and tell her how pretty she is, I would have to agree. Zoe is a very sweet dog! But she does get a bit growly in the evening when she wants to be left alone or around her food! This is a pic of her and my 2 dachshunds, Gaby & Nuts. 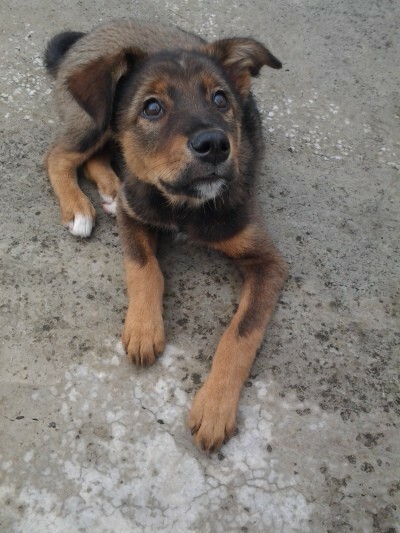 Help me figure out the breed of my dog please! 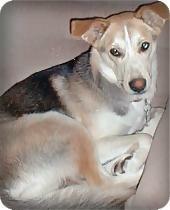 I rescued Kody from a shelter in March of 2007 and his paperwork said he was about 1 year old and German Shepherd mix. Since then, people have told me he looks like he has some Husky, Malinois, or Chow (because of the spots on his tongue) mixed in. 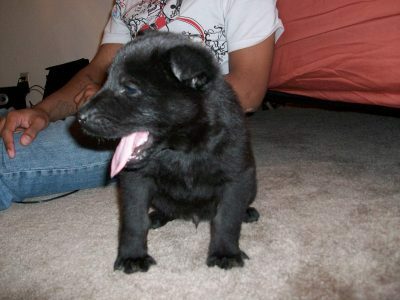 Many people say that he can't be purebred German Shepherd because he is too small. 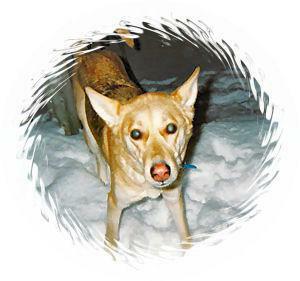 He is 60 lbs with light-medium brown eyes, soft fur, and a straight tail. He has a white undercoat and sheds a ton. He is super smart, protective, very friendly, not overly energetic, somewhat vocal but doesn't bark too much, very sweet and playful. 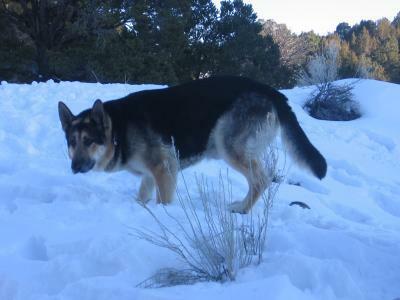 This picture (from Jan 2008) and is the best profile shot I have of Kody, but keep in mind that my boyfriend is standing behind him (boyfriend = 6'1") and Kody's back legs are bent (usually his back is straight across, not slanted downward). I cannot tell you what breed he is but I used to have a dog that very much like him. 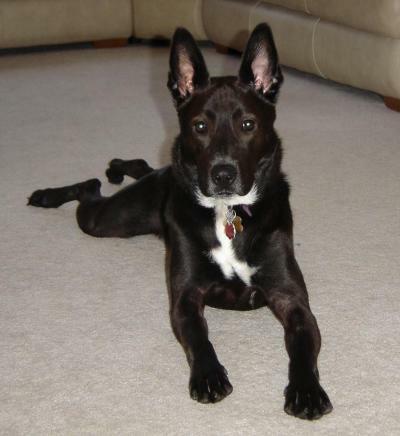 The dog I had had a curved tail and a very thick neck. He was all red, however. He was also very territorial and protective. 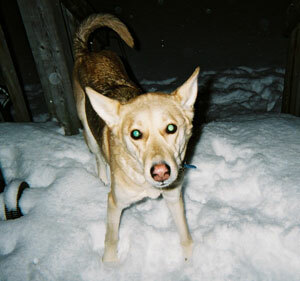 I am sure he was a mutt but he was the smartest dog I ever owned. It is hard to believe but I taught him to "talk"....just one sentence and it was "I want some" when I was feeding him a treat. I cried for a year after he was gone, never had been so close to a dog before and haven't been since. He did have a bad fault, however. If he got off his leash, he was gone and only came back home when he was ready. For that reason, I had to give him away. it could possibly have some lab in it. Regardless, hes a beauty....and obviously well loved! Your pic made me laugh. 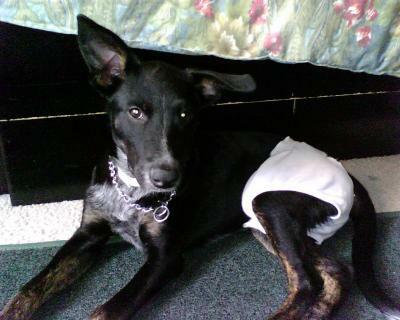 It looks like your dog's taking a leak! 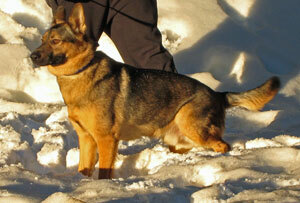 That aside, he's a good looking dog; definitely a LOT of german shep in him, probably about 3/4. There may also be some Belgian Malinois in there. They look very similar to a Shep but are a bit more on the lean/thinner side than most Sheps. The dog really doesn't look like a Chow. Black spots are nothing more than a birthmark. Without seeing a few full standing photos; it's hard to say more. Your dog may also simply show much more of some genes than others. For example, when most breeds mix with a Dobi; they RARELY look like the Dobi at all...unless you look for close signs like a narrower head than you'd otherwise expect or more agile. You might want to look at his diet if he isn't energetic. He should be getting a good hour of brisk exercise or more everyday. i agree, he is a german shep. 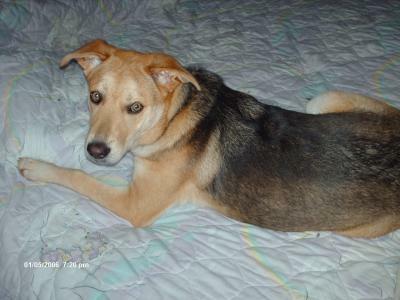 mix, he definetly looks it alot, but i dont think i would say fullblooded,"He has a white undercoat and sheds a ton. He is super smart, protective, very friendly, not overly energetic, somewhat vocal but doesn't bark too much, very sweet and playful" these all describe a german perfectly,he is definently not chow, people try to say that black spots are signs of chow blood but that is totally wrong they are just birthmarks, infact my purebreed,papered, german shep has dark spots all over his tounge.it is not unusual.i'm not to sure about the husky either,i think their characteristics tend to dominate,and he doesnt look it to me, maybe malinois.he is so very beautiful though.goodluck with your quest sorry i couldn't be more helpful. megan. i couldnt tell you what breed he might be. 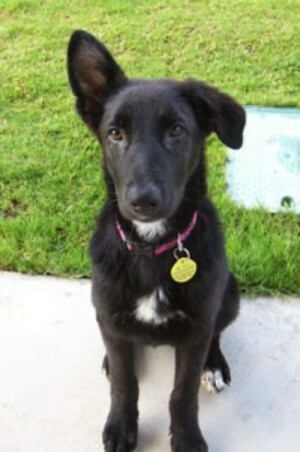 but i have ally my mix breed and before her i had glory a mixed breed. i also loved them both more than explanation can allow. you have a lovely dog there. 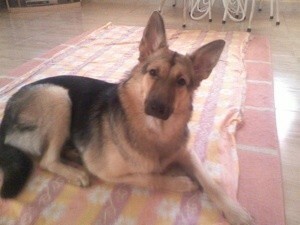 @hedera: an Alsatian IS a German Shepherd. That name was invented during WWII to avoid calling them "German" - q.v. Salisbury Steak, Freedom Fries. hello i just got a puppy today its 3/4 german shepherd and 1/4 husky. my puppy and your puppy have like the same facial features can u see that? Carol my friend has the same exact dog he is a German Shepherd. Question: What Breed Is My Dog? 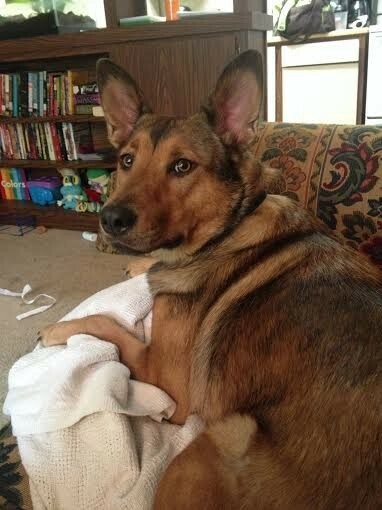 I was told my dog was a German Shepherd Chow mix, but I'm not sure. He has webbed feet. I was kinda thinking he could be Lab mix. I just don't see the German Shepherd. What do y'all think? 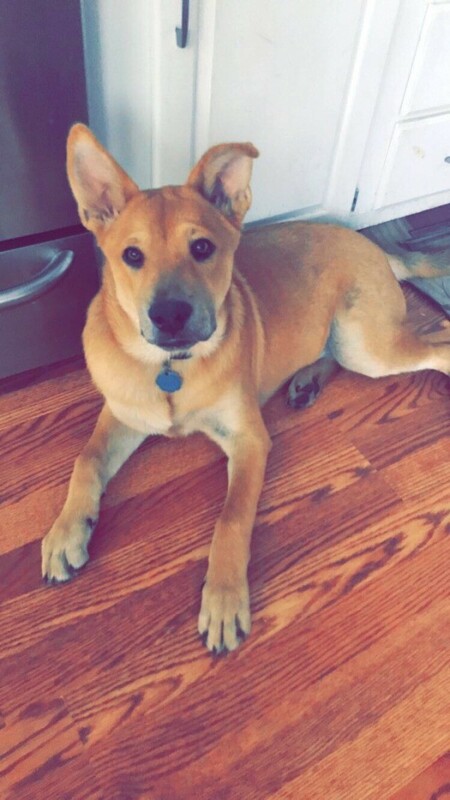 Question: What is My German Shepherd Mixed With? 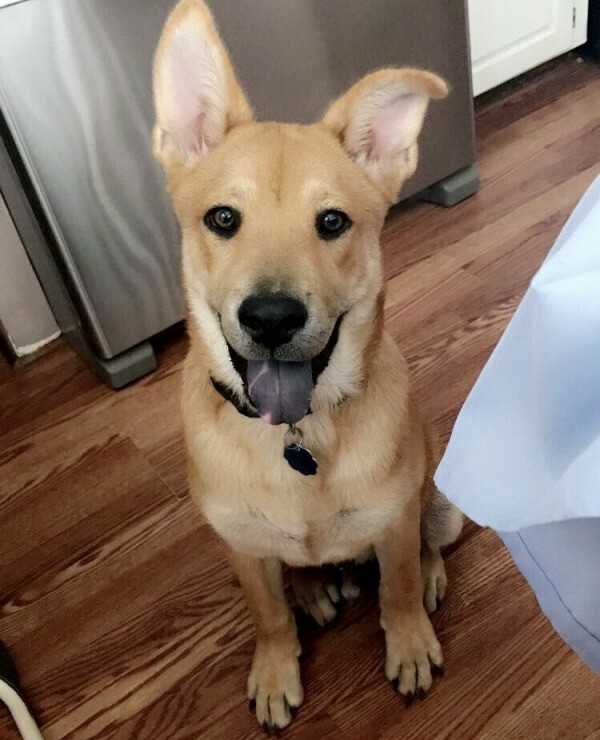 What is my German Shepherd mixed with? He is 12 weeks and 28 pounds. He has huge paws; the vet said he would be 100-125 lbs. What breed is my dog? She's 8 months old, 26 inches at the shoulders, and weighs about 60 lbs. I know she's a German Shepherd but I don't know what she's mixed with. Can somebody help? Thanks. I'm just wondering if anyone knows what she (Jaz) might be mixed with? I see a lot of German Shepherd, but I just can't figure out anything else. She's 2 years old, very energetic, likes water, and is protective over my little one, also very loving and thinks she's a lap dog. She's about 50 pounds. Thanks! She is smaller, maybe about 50-60 lbs. Definitely has the personality, very smart, and very protective. She is chestnut with a black face and white on her chest. 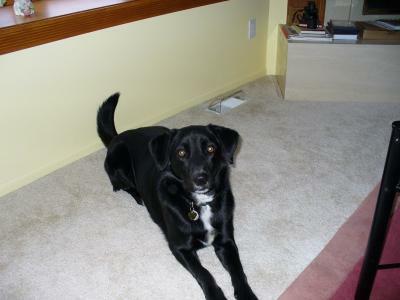 I'm a long time dog owner and I would say Labrador and/or Border Collie. 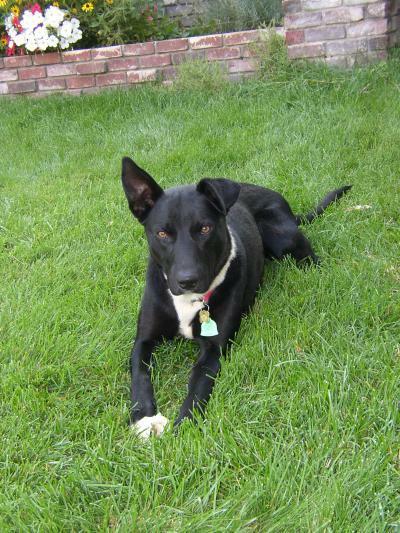 We have a Lab and German Shepherd mix and he looks exactly like that. Here is a picture of our puppy. 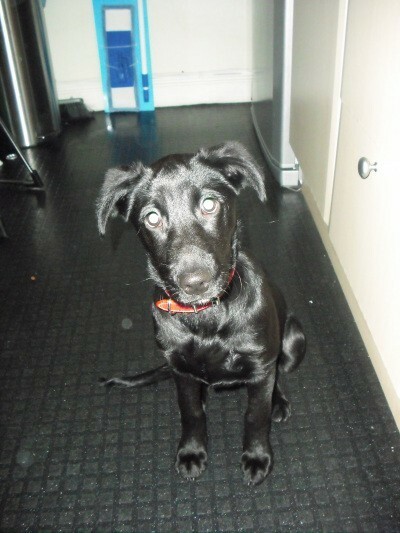 Definitely a German Shepherd cross. Not a Kelpie. 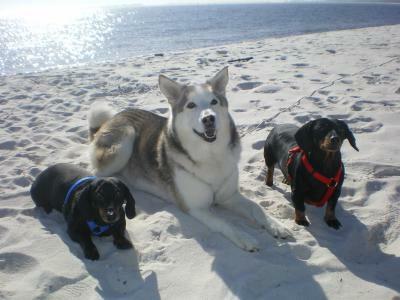 I raise and train Kelpies and and am a dog trainer. This is def a Shepherd cross. German shepherd, and "in the mix" Airedale and Bernese Mountain dog. I guess she's just a mutt! 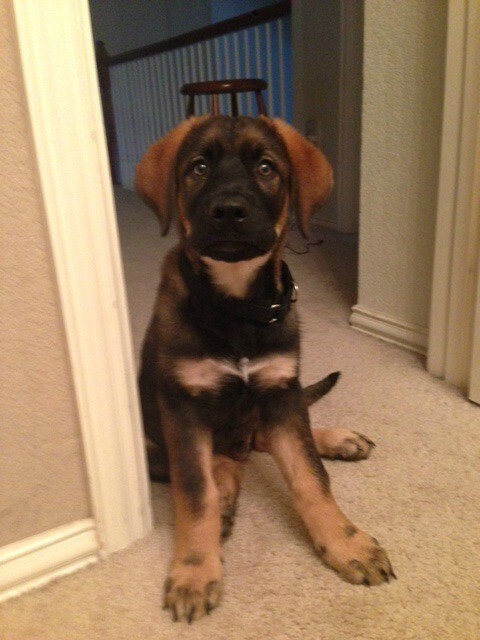 Is My Puppy a German Shepherd Mix?